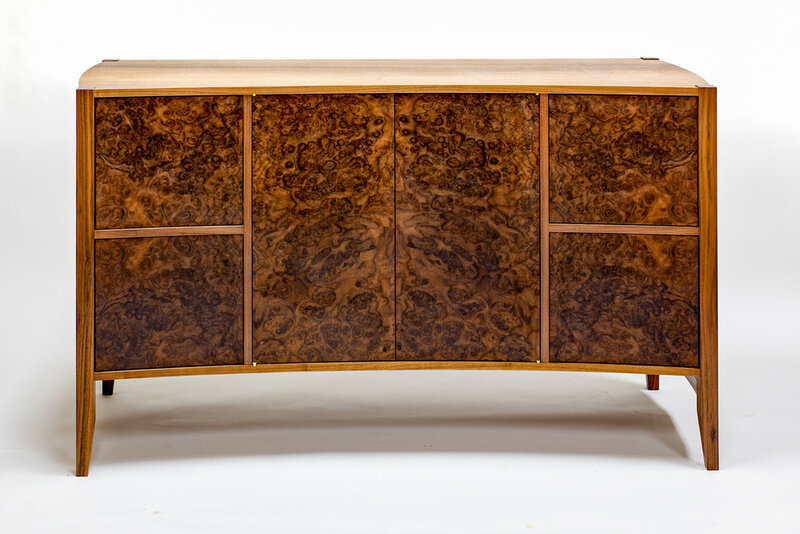 This credenza is made of a mix of solid and veneered walnut, featuring front and end panels of highly figured walnut burl veneer. The Roberts Credenza is deceptively complex since graceful curves at the front and side dictate that drawer fronts and doors also have to be curved. The sides and front components are made of layers of bending plywood and veneer bent against two separate forms. The hand-cut dovetailed file drawers ride on full-extension, soft-closing slides, and the doors are hung with brass knife hinges. Both the drawers and doors make use of push-to-open hardware to keep the front lines clean. This piece won Second Place overall at the 2017 Texas Furniture Makers Show at the Kerr Arts and Cultural Center in Kerrville Texas. Finished with shellac and wax.